WDAD has a track record delivering results in the public sector including at a senior level. This is one example that proved as effective as it did eye-cataching. Working with JGP Resourcing and their partner, Birmingham City Council, we undertook a creative recruitment advertising campaign for Hackney Homes, part of London Borough of Hackney, who were undergoing a major change programme. They were looking to radically transform their housing management service – in total, they had over 40 management positions to fill, a number of which were at a senior level. We devised an appealing print and online advert that ran across various local media in neighbouring boroughs. 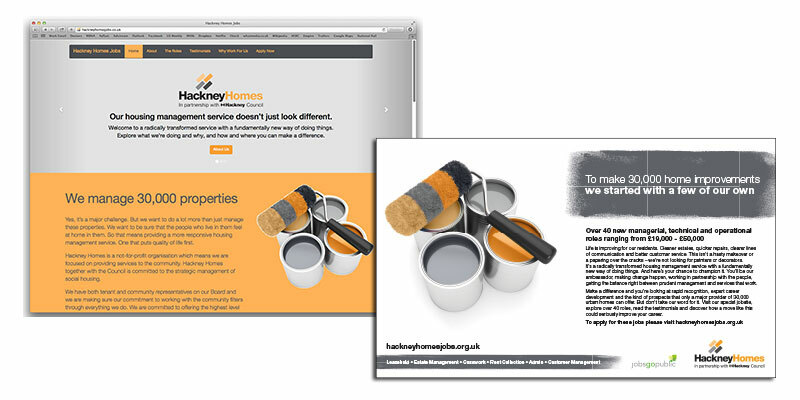 We ran with a headline ‘To make 30,000 home improvements, we started with a few of our own ’ and the imagery played on the DIY theme throughout, something that was mirrored in a campaign microsite that we also devised. JGP and BCC provided the joined-up response and assessment services. The advertising pulled in over 2,000 applications and whilst the interviewing process isn’t finished, 29 of the roles have been successfully filled and more offers are to be made. As well as offering a fantastic ROI, the whole campaign also picked up the accolade of Best Volume Recruitment Campaign at the 2014 PPMA awards.